From September 2016 to February 2017, a trial excavation was conducted on the eastern and southern fringes of Tel Bet Shemesh (Permit Nos. A-7802, A-7882; map ref. 197816–8042/628481–786), prior to the widening of Highway 38 and following the discovery of antiquities in trial trenches, which were opened prior to the excavation and during its course (Fig. 1). The excavation, undertaken on behalf of the Israel Antiquities Authority and financed by the Netivei Israel Company, was directed by E. Haddad (Area H3 supervision, photography) and N. Ben-Ari (Area H2 supervision, trial trenches and preparation of excavation area), with the assistance of N. Isaac (supervision of Areas G, H, I), R. Ben Chelouche (educational program), Y. Lavan (administration), M. Kahan, A. Hajian, V. Asman and Y. Shmidov (surveying), A. Peretz (photography), G. Fitoussi and Griffin Company Ltd. (aerial photography), D. Levi (GIS and mapping), S. Gendler (metal detection), H. Neugeboren and H. Salovitz (Jerusalem District educational center), Z. Turgeman-Yaffe, Y. Tzur, A. Nagar (trial trenches), A. Shadman, A. Eirikh and Y. Zelinger (Israel Antiquities Authority, Jerusalem District), B. Storchan (computerization consultant), N. Marom (archaeozoology), Y. Nagar (physical anthropology), Y. Paz (auxiliary sciences consultant), O. Ackerman (OSL), A. De Groot (Iron Age pottery consultation), I. Taxel (late periods ceramics), Y. Gadot, L. Freud, Z. Lederman L. Buzaglo, E. Kaho (conservation and revetment work, IAA Conservation Department), E. Kamaisky (pottery restoration), T. Shabi, N. Glickstein, M. Piatski (educational guidance) and Y. Sitton (supervision). Teenagers from premilitary programs and two schools participated in the excavation at various times through the IAA Jerusalem District educational center, as well as volunteers from France and Switzerland and laborers employed through a manpower company. Additional assistance was provided by R. Amasis, project manager on behalf of the Netivei Israel Company. Special thanks to the town of Bet Shemesh (Urban Improvement Division) for providing the excavation site with water. Tel Bet Shemesh is located in the northern Shephelah at an elevation of 240 m asl. The excavated area (length c. 600 m, width 50–100 m), on a spur connecting it with Tel Bet Shemesh along a saddle, is oriented in a general northeast–southwest direction. On the northwest it slopes gradually westward, toward the Nahal Soreq floodplain. On the south it slopes gently down to the Nahal Yishʽi floodplain. Forty excavation squares were opened in three areas (Fig. 2); they were allocated letters in continuation of those designated to previously excavated areas: Area G, west of Highway 38, on the southeast slopes of the tell; Area H, east of Highway 38 and the tell’s summit—the largest, most northerly area, which was divided into three sub-areas (H1, H2, H3); and Area I, the most southerly area—south of Area H, southeast of the tell’s summit and east of Highway 38. Robinson was the first to identify the site with biblical Bet Shemesh. In 1911–1912, D. MacKenzie excavated the tell for the first time and unearthed fortifications from the Middle Bronze Age, including a magnificent gate on the southern side of the tell. An enormous monumental building, named the ‘Byzantine monastery’, was also discovered (Bunimovitz and Lederman 2013; Mackenzie et al. 2016). In 1929–1933, Grant’s excavations in the west part of the tell uncovered occupation strata from the Late Bronze Age, Iron Age I and Iron Age II (Grant and Wright 1939). From the early 1990s to the present day, the tell has been excavated by S. Bunimovitz and Z. Lederman on behalf of the University of Tel Aviv. Their excavations have revealed and identified nine settlement layers, from the Middle Bronze Age IIB to the end of the Iron Age IIB, as well as a reservoir (Bunimovitz and Lederman 2016). 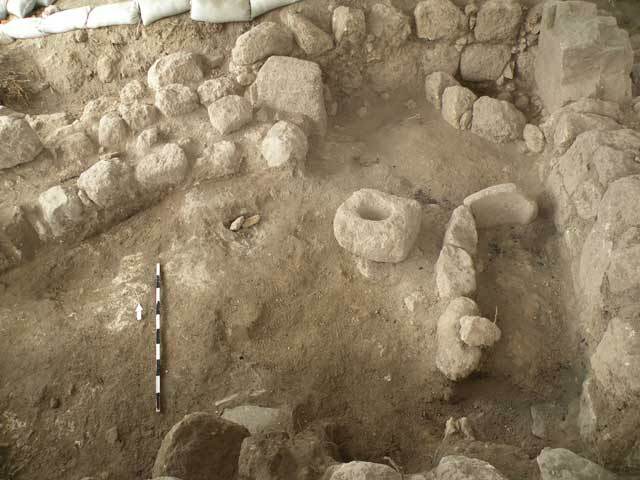 In addition to these excavations, several salvage excavations have also been conducted. Prior to the construction of Highway 38, in the late 1960s, Tzaferis (1969) unearthed Iron Age and Byzantine-period finds (the precise location of the excavation is unknown). In 2012, A. Nativ dug trial squares on the eastern fringes of the tell (Permit No. A-6439), revealing remains from the Mamluk and Byzantine periods and from the Iron Age IIC. In 2013, N. Ben-Ari excavated trial squares in the sheikh’s tomb compound, concluding that the compound was built in the Ottoman period (Permit No. A-6836; Ben-Ari forthcoming). Seven squares were opened and an ancient north–south road was partially unearthed (Fig. 3). The road is delimited on the east by a row of large fieldstones. It is abutted by the road’s bedding, which consists of small and medium-sized fieldstones. The adjacent trial squares yielded Iron Age IIB–C pottery, suggesting that the road was built no earlier than these periods. 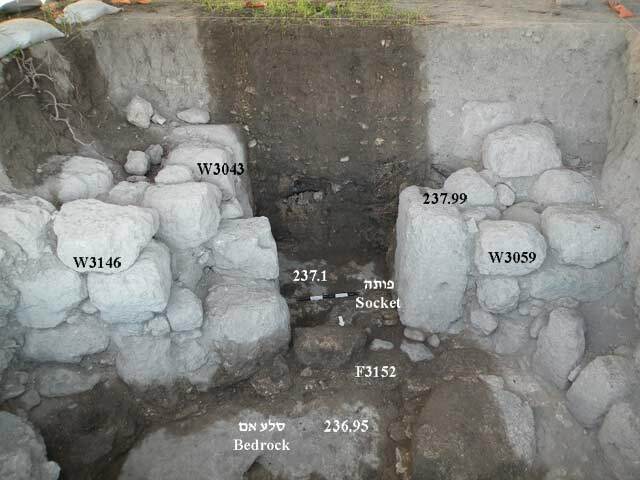 A similar road discovered at Tel Lakhish was dated to Iron Age IIC (Ussishkin 2013:317). OSL samples taken from beneath the road will allow for more accurate dating in the future. 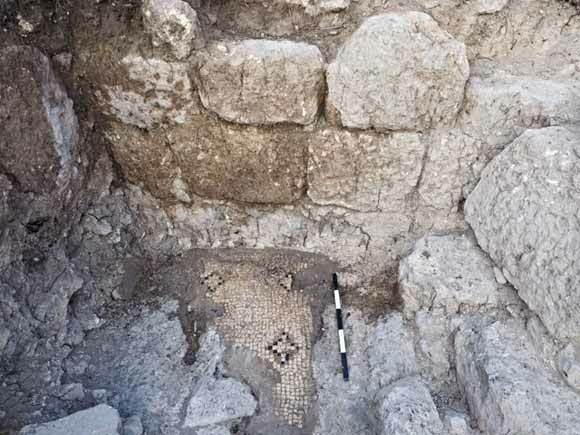 Five excavation squares opened east of Highway 38 and south of the sheikh’s tomb compound yielded remains from Strata 8–6. 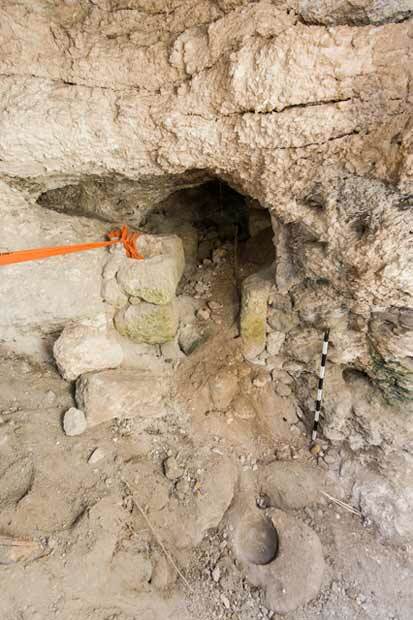 A rock-hewn shaft, which was partially excavated, was attributed to Stratum 8; a large stone found in the lower part of the shaft may seal an opening leading to a burial chamber. 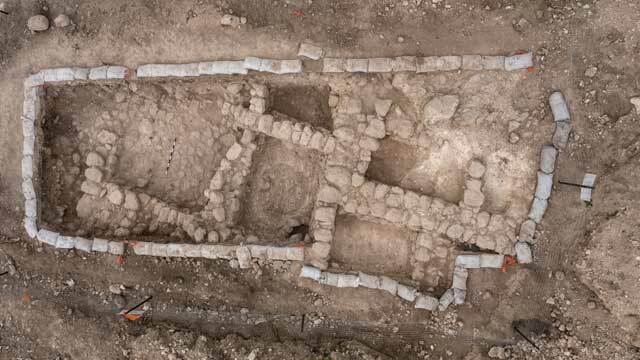 The remains from Stratum 7 comprise a building unearthed along 10 m in a southwest–northeast direction that consisted of at least three rooms arranged in a row (Fig. 4); part of the building was constructed over the Stratum 8 shaft. Based on the large quantity of pottery recovered from the building, it was probably occupied no earlier than Iron Age IIC. Thirteen pit graves belonging to Stratum 6 were dug into the remains of the building; one grave was excavated, but no diagnostic finds were discovered. Numerous fragments of pottery vessels from the late Hellenistic/Hasmonean period (second century BCE) were discovered near the graves. In the area adjacent to the sheikh’s tomb compound, 10.5 excavation squares were divided into three groups—south, center and north—based on surface finds and the results of the trial trenches. Sub-Area H2 South. Five excavation squares were opened (Fig. 5). A large, nearby cave was cleared of a layer of modern debris, revealing four openings and rock cuttings in the walls, some incorporating ashlar construction. One opening, apparently an original one, was hewn in the east part of the cave’s roof (through which a fig tree now grows). A second opening, in the north part, is probably a later breach. Around a third opening, west of the original one and near the sheikh’s tomb, was building rubble that had collapsed into the cave; it may have come from a roofing added at a later stage. A fourth opening, flanked by ashlar-built pillars (Fig. 6), was set in the southern wall of the cave and probably led to the sheikh’s tomb compound via an underground passage; it was found under the building/roof rubble. A trapezoid-shaped weight was discovered inside the cave. The top of a cylindrical weight of an olive press was unearthed immediately to the northeast of a hewn niche flanked by ashlar-built pillars set in the western wall of the cave (Fig. 7); the weight was probably used to anchor a pressing beam. A spacious cavity stretching northward, below the opening in the northern wall, indicates that the cave is much larger than was initially presumed. To the north of the cave’s entrance, a potsherd dump left by one of the first archaeological expeditions at the site was uncovered. To its east, a rock-hewn installation containing two ‘troughs’ was found beneath two floors, one above the other, that date from the late Byzantine/beginning of the Early Islamic period (Stratum 4) and rendered the installation obsolete. 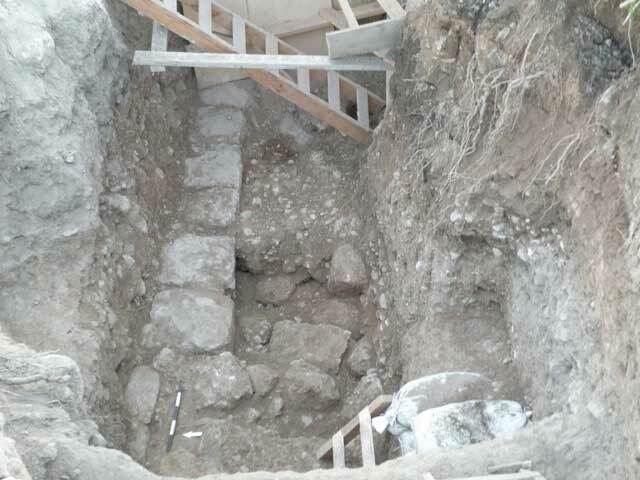 Seven construction phases from the Ottoman period (Stratum 1) were found above the Stratum 4 floors. Pottery from the Iron Age IIC and the Persian period was recovered above the bedrock in the southeast part of the area. Sub-Area H2 Center. Four and a half squares were excavated. The earliest stratum, which probably dates from the Byzantine period (Stratum 5), yielded part of a large public building (Figs. 8, 9). It was solidly built on several steps of ashlars with drafted margins, which were preserved to a height of at least four courses. One of the rooms contained a small section of a mosaic floor decorated with geometric motifs (Fig. 10). Two square shafts built in the northern part of the building led down to an elliptical rock-cut reservoir coated with plaster (Fig. 11) that was probably installed in the basement of the building. A deliberate fill of soil and medium and large stones had been placed along the outer face of the northern wall, to its full height. 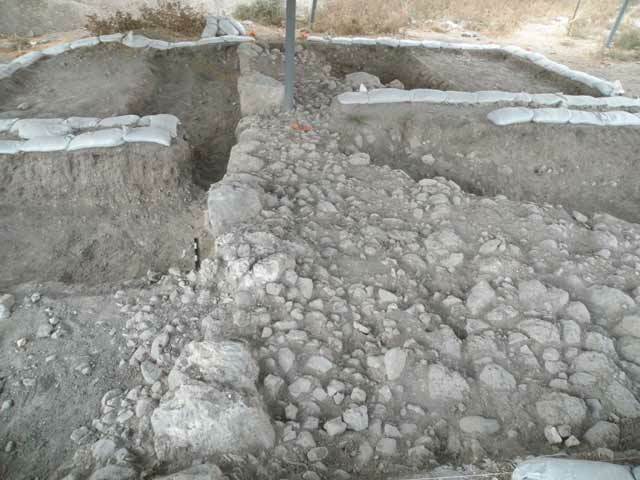 The purpose of the fill, which contained mainly Byzantine-period pottery (Strata 4, 5), is unclear. 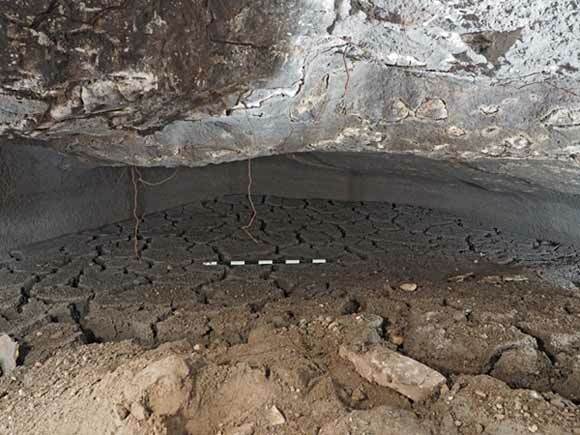 A plaster floor found above the roof of the underground reservoir contained a circular, plastered installation that probably dates from the Early Islamic period. It seems that the shafts and the reservoir continued to be used in Strata 3 and 4. Sections of walls and habitation levels that probably date from the Early Islamic period (Stratum 3) were built over the deliberate fill. A building dating from the Ottoman period (Stratum 1) was constructed above these remains. Sub-Area H2 North. A single excavation square (Fig. 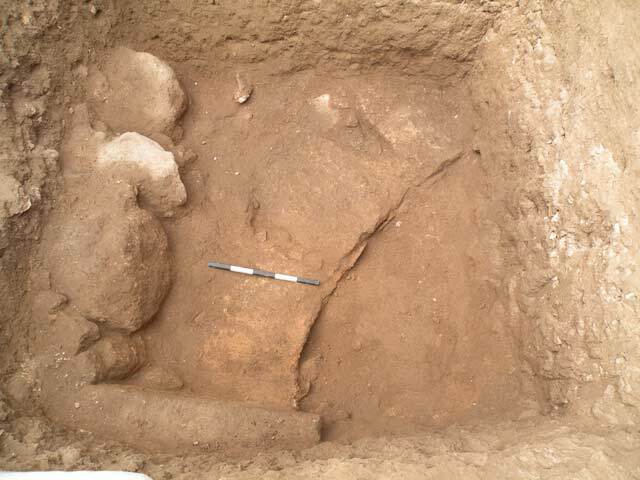 12) was opened in the northwest area of the excavation. A fill containing potsherds dated to Iron Age IIC and the Byzantine and Early Islamic periods extended down to a depth of 4 m below the surface. At a depth of 2 m, the top of a poorly constructed east–west wall was unearthed; it was founded directly on the bedrock. Adjacent and parallel to this wall, to its south, was a wall built of large fieldstones interspersed with small and medium-sized stones. The walls may have functioned as retaining walls and/or terraces. Fourteen squares in the eastern part of the excavation were divided into three groups: south, center and north. Sub-Area H3 South. Eight and a half squares were opened in the southern part of the area and up the hillslope, in a row running down the slope from north to south; two were located perpendicular to this row, to its west. The northernmost square yielded part of the northern wall of an imposing building (Fig. 13). The wall included an entrance threshold with a socket that faces south and has a large stone jamb to its west. The building’s walls were constructed of large, dressed fieldstones with no bonding material. A yellowish floor containing small stone grits abutted the wall and the entrance from the east. Numerous Iron Age IIC potsherds were found in the fill beneath the floor. A similar floor unearthed to the south of the wall was laid directly over the bedrock and continued beneath the large stone jamb, indicating that the jamb was a later addition. The building was in use in the Ottoman period, based on a construction phase from this period found to the north of the wall and incorporating the building, as well as a refuse pit on the south side of the wall containing numerous animal bones, fragments of burnt wood and Ottoman-period pottery. The southern part of the row of squares yielded a section of an impressive, Byzantine-period stone paving (Stratum 5; Fig. 14) at a depth of 4 m below the surface. The bedrock was reached on the west side the area, as the paving there apparently did not survive. Sections of poorly preserved walls were unearthed to the west of the missing paving. A small section of a plaster floor dated to the Early Islamic period (Stratum 3) was uncovered c. 2 m south of the paving; it contained a glass weight. Remains belonging to Stratum 1 were discovered near the surface. They included layers of ash, remains of hearths and fragments of poorly preserved walls, two tabuns, a large quantity of animal bones and another refuse pit (c. 4 m deep) that cut into the eastern part of the imposing stone flooring from Stratum 5. In the southern square, further up the hill, was a square pillared building (6 × 6 m; Fig. 15), which originally seems to have carried a dome. The spaces between its four pillars were blocked with walls, apparently a later addition. A probe dug beside the northwest pillar revealed that it was founded on bedrock, c. 4 m below the level of the pillar’s base, and it penetrated the Early Islamic floor (Fig. 16). The probe made it very clear that the foundation was abutted by construction fills placed there at when the foundation courses were laid. As Ottoman-period pottery was discovered within the fills, it is probable that a fill was laid for construction purposes (Stratum 1): to raise the level of the building far higher than the earlier existing surface. Sub-Area H3 Center. 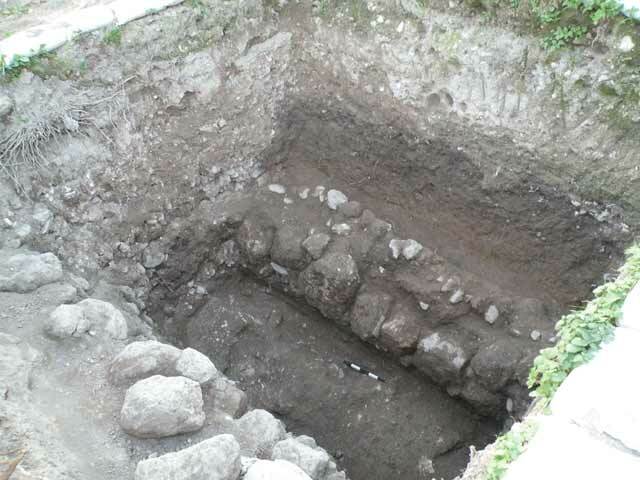 Approximately three and a half excavation squares were opened. The earliest stratum, whose date could not be ascertained, yielded a deep, narrow circular shaft (diam. c. 0.5 m, depth 4.7 m), that probably led to a large underground cavity. 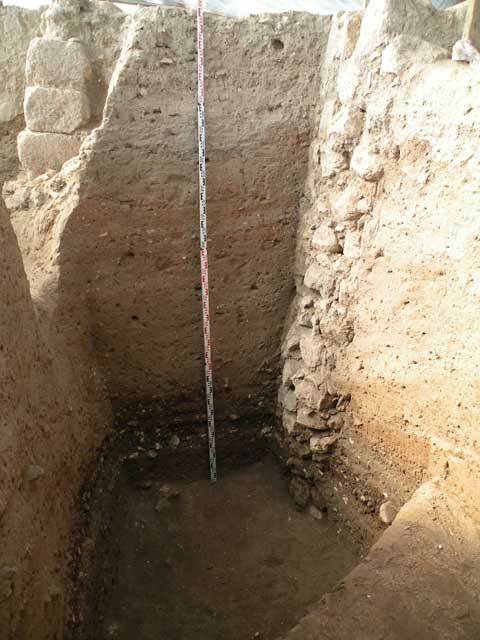 Not only does the shaft clearly predate the Byzantine period (Stratum 4), it resembles one of the narrow shafts of the eighth-century BCE reservoir at Tel Bet Shemesh; it thus may lead to another Iron Age II reservoir. The location of the shaft—in the corner of an olive-press structure (below) which was built over it, and its opening which was deliberately blocked with a stone slab, indicate that it is not connected to the oil press, although the builders of the oil press probably discovered it. The Olive press was dated to the Byzantine and Early Islamic periods (Strata 4, 5; Fig. 17). The northern part of a structure was uncovered in two excavation squares: an in situ large screw weight and part of the crushing installation built of dressed stones. The walls of the olive press were built of large ashlars. Two phases were detected: the western wall was built on top of a stone paving from the earlier, Byzantine-period phase (Stratum 5), reducing and narrowing the area of the olive press in the Early Islamic period (Stratum 4). 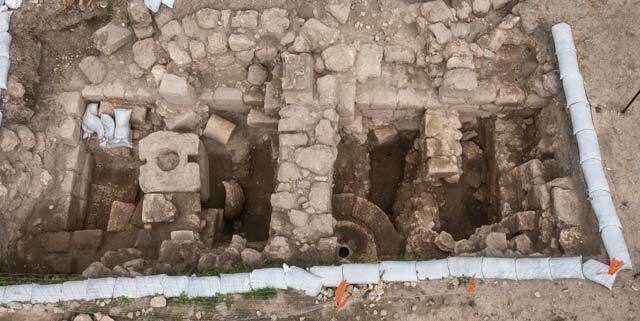 It is worth noting that the olive press extended beyond the limits of the excavation. 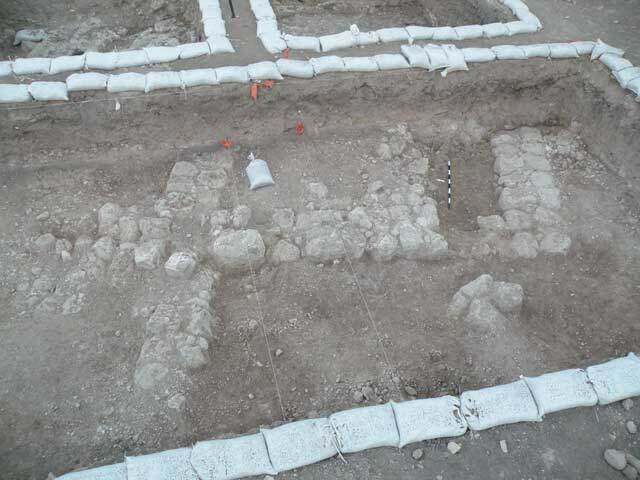 Byzantine architectural remains belonging to Stratum 5 were unearthed in the squares to the northeast, c. 20 m away from the olive press: a layer of a Byzantine-period fill covering part of a massive wall built of large, roughly hewn stones and aligned east–west (Fig. 18). To the south, the wall was abutted by a tamped bedding of stones and mortar laid on top of a deliberate fill containing large hewn building stones that had been placed haphazardly to level the desired foundation height. Upon dismantling the bedding, pottery dating from the Byzantine period was recovered. A layer of soil (depth c. 0.7 m) excavated in squares northeast of the olive press and above the Byzantine layer yielded handmade, geometrically decorated potsherds from the thirteenth–fourteenth centuries CE (Stratum 2?). The pottery was found devoid of any architectural context, but building remains from this period might be located nearby. 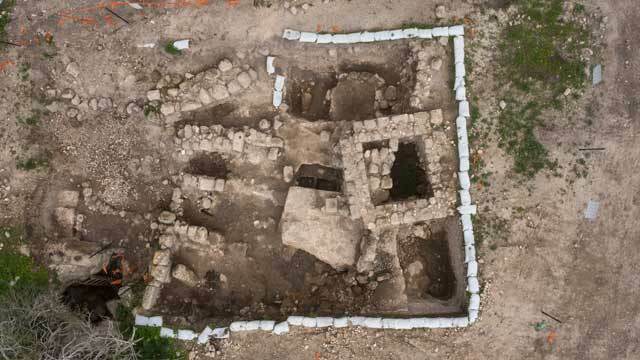 Remains of the Ottoman-period village (Stratum 1) were unearthed above the Stratum 4 olive press. They included part of a building with a broad, north–south wall that divided the area into two rooms: east and west. In the broad wall, part of a crushing basin from an olive press could be discerned in secondary use. The floors in the rooms were composed of thick white plaster. In the west room (Fig. 19), a few stone installations were built near the wall. Additional remains from the village were unearthed: three rooms exhibiting several construction phases. The east room had an entrance threshold set in its northern wall. The floor in one of the rooms was composed of soil mixed with whitish calcareous material. Beneath it were at least three floors that were also dated to the Ottoman period. Sub-Area H3 North. Two squares, north and south, excavated in the northeast part of the area revealed two strata. 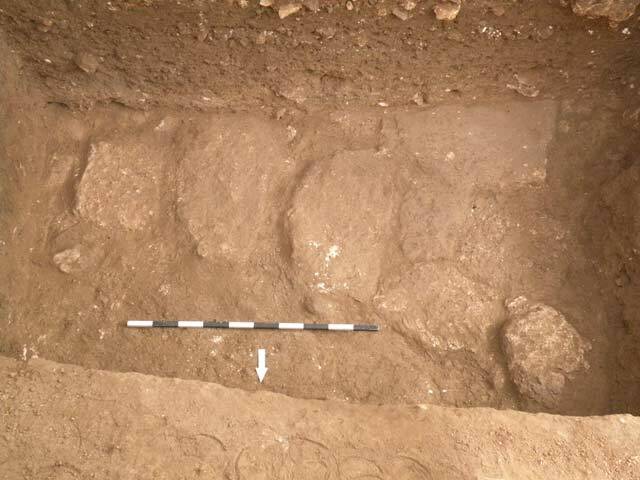 The earlier stratum, dated to the Byzantine period (Stratum 5), yielded part of a circular kiln (depth c. 5 m; Fig. 20) constructed of large stones whose rounded interior was lined with reddish clay slabs. A thick fill (4.5 m) above the kiln contained Ottoman pottery. Remains of part of a broad, east–west Ottoman-period wall were uncovered above the fill, but since the wall extends beyond the boundaries of the excavation its function was not ascertained. In the area southeast of the tell and east of Highway 38, two and a half squares were opened in a row down the southerly slope, and one square was excavated 15 m to their east. In the row of squares, well-preserved remains of terraced buildings built directly on the bedrock and dated to the Iron Age IIC (Stratum 7; Fig. 21) were partially unearthed. The rooms contained collapses and floors; intact vessels and fragments of vessels dating from the seventh–sixth centuries BCE were recovered from beneath the floors, from above them and from the collapses. Stone vessels and rich botanical finds, mainly olive pits, were also discovered. One of the rooms yielded two lmlk handles bearing a two-winged seal impression, ‘lmlk mmst’. The walls of the rooms were partially preserved to an average height of 1.3 m. Additional walls built directly on the bedrock were encountered near the surface in the eastern square. These walls were similarly dated based on the pottery finds to Iron Age IIC (Stratum 7). 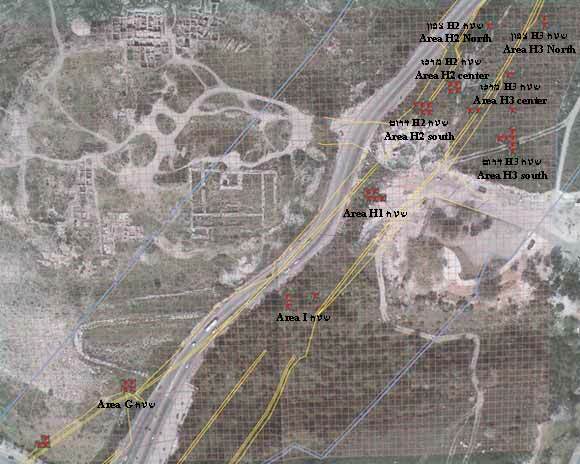 The eight strata detected in the excavation exhibited a clear chronological distinction between the excavation areas: whereas remains of the Iron Age IIC settlement were concentrated mainly to the south of the sheikh’s tomb compound and east of the tell, those from the Byzantine period onward were found concentrated mainly to the north of the sheikh’s tomb. 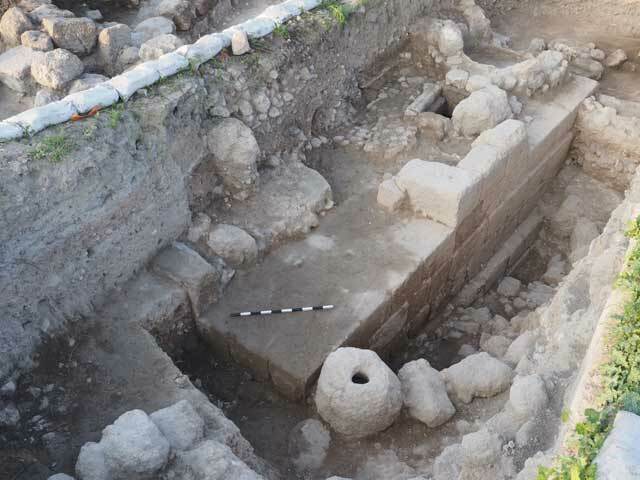 Although unearthed in a limited area, the Iron Age remains clearly attest to a settlement that existed from the seventh century BCE onward (701–586 BCE). The city was rebuilt after Sennacherib’s invasion and shifted eastward, to the eastern part of the saddle, today to the east of Highway 38. 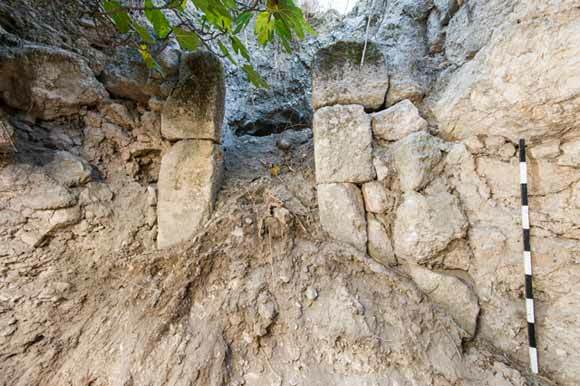 The remains of the Ottoman-period village of ‘Ein Shams, which was abandoned no later than the first half of the nineteenth century, were discovered north and east of the sheikh’s tomb in Areas H2 and H3. The remains included buildings, installations and tabuns/kilns. From the surface remains, it was evident that the village extended eastward, beyond the limits of the excavation. These Ottoman-period remains include an especially impressive building: four pillars, probably surmounted by a dome, built on the east part of the hill. The original structure appears to have been open on all four sides; it was surrounded by walls in a later phase. To construct the building, considerable effort was invested in laying a deliberate fill that raised the elevation of the hill by about 5 m above bedrock. In many of the excavation squares, it was evident that the Ottoman-period village was built over remains from the Byzantine and early Islamic periods. Another noteworthy building unearthed in the excavation is the massive Byzantine structure in Area H2, which may be part of a church complex. 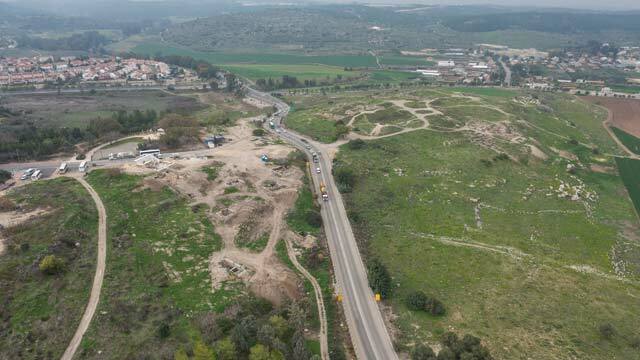 The results of the excavation confirm that Tel Bet Shemesh extends east, southeast and northeast, beyond the areas excavated in the past, and that Highway 38 does not mark the eastern boundary of the tell. Ben-Ari N. Forthcoming. Tel Beit Shemesh: The Wali of Sheikh Abu Mizar. Salvage Excavation Reports. Bunimovitz S. and Lederman Z. 2013. 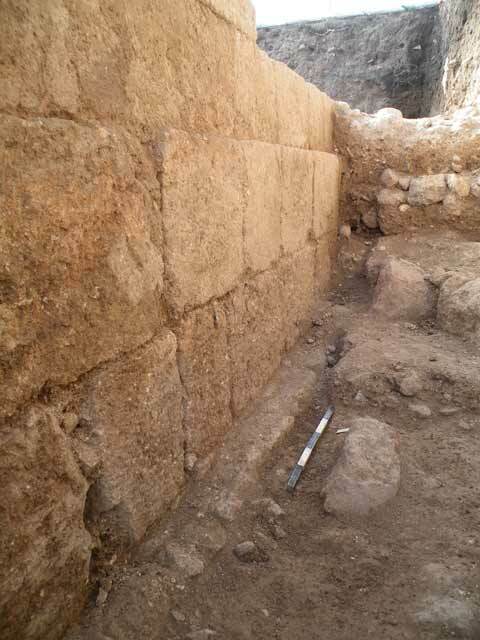 Solving a Century-Old Puzzle: New Discoveries at the Middle Bronze Gate at Tel Beth-Shemesh. PEQ 145:6–24. Bunimovitz S. and Lederman Z. 2016. Tel Beth Shemesh, A Border Community in Judah: Renewed Excavations 1990–2000: The Iron Age (Tel Aviv University Institute of Archaeology Monograph Series 34; 2 vols.). Tel Aviv. Grant E. and Wright G.E. 1939. Ain Shems Excavations (Palestine) V: Text. Haverford, Penn. Mackenzie D., Bunimovitz S., Lederman Z. and Momigiliano N. 2016. The Excavation of Beth Shemesh, November–December 1912. London. Tzaferis V. 1969. Tel Bet Shemesh. HA 30:25 (Hebrew). Ussishkin D. 2013. 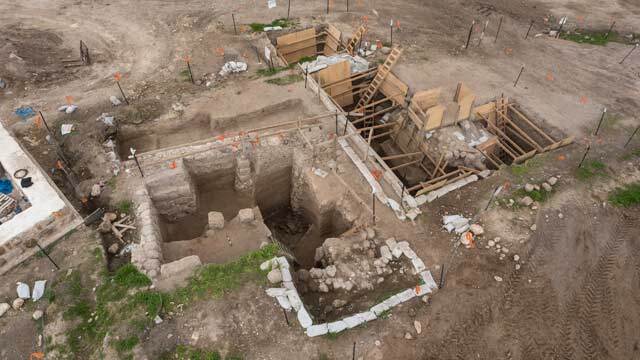 Biblical Lachish: A Tale of Construction, Destruction, Excavation and Restoration. Jerusalem (Hebrew). 1. Aerial view of the excavation area east of Highway 38, looking south. 2. Excavation areas and squares (marked with red X). 3. Area G, Iron Age II(?) road, looking south. 4. Area H, Sub-Area H1 building, looking east. 5. Sub-Area H2, looking north. 6. Ashlar-built entrance in south wall of cave, looking south. 7. Niche for oil-press beam in west wall of cave, looking west. 8. Sub-Area H2 Center, ashlar building, looking southwest. 9. North wall of structure/reservoir, looking southwest. 10. Section of mosaic pavement, looking west. 11. Reservoir’s interior, looking north. 12. Sub-Area H2 North, looking northwest. 13. Sub-Area H2 South, massive building (Iron Age II?) and entrance, looking south. 14. Byzantine-period stone flooring, looking south. 15. Aerial view of Area A, looking west. 16. Trial trench beside northwest pillar, looking west. 17. Oil press, looking north. 18. Massive wall from the Byzantine period, looking east. 19. Ottoman-period room with installations that sealed the oil press from Strata 4 and 5, looking north. 20. Part of a kiln, looking west. 21. Area I, Iron Age building, aerial view looking west.